Nepal is the kingdom of the mighty Himalayan Mountains, a clashing of cultures, a melting pot of religions, and the Adventure Capital of the World. Only here do you have the World’s greatest rivers, the Highest Mountains, the most sublime valleys, and the crossroads between Tibet and India. Wildlife abounds, and the opportunities for Adventure are too many to count. You will be escorted to this wonderful country, and introduced to the wonders of the Himalayan Kingdom. The awesome alternative to the traditional Everest Base Camp trek includes three passes, the Chola Pass, Kingma La and and Reno La, climbing higher than Everest Base Camp. During the course of your trip you will make an exploration of the Khumbu region including the beautiful Gokyo Valley and Lakes and down to Gorak Shep, with a visit to either Everest Base Camp itself, the nearby peak of Kala Pattar before descending back down the Khumbu Valley to Namche Bazaar and Lukla for a memorable flight back to Kathmandu. In Kathmandu you have a day for sightseeing, with the opportunity to soak up the atmosphere of this amazing land before heading home. Day 01: Fly UK to Kathmandu. Day 02: Arrival in Kathmandu, transfer to hotel, welcome dinner, overnight in a hotel. Day 03: Sightseeing around in Kathmandu valley, overnight in a hotel. Day 04: Transfer to the airport, flight to Lukla, trek to Phakding (3hrs, 2610m) overnight in lodge. Early in the morning have a breakfast and drive to airport to take flight by Twin Otter aircraft to Lukla, the most renowned mountain airstrip in the world. On the flight we watch the rugged foothills give way to the snowline of the Himalaya; many of the world's highest mountains, including Kanchenjunga, Lhotse and Makalu (the world's 3rd, 4th, and 5th highest respectively) may sometimes be seen from the window of the plane. Once we are in Lukla we pick up our porters with bags and start the trek, amazingly this high-altitude trek begins by descending to the river at Phakding where we stay overnight. Day 05: Trek to Namche Bazaar (6hrs, 3440m) overnight in lodge. Walk through the busy trail and view the tantalizing glimpses of KusumKangru (6,369 m.) Everest (8,848 m.) and Nuptse (7,879m). We continue trekking along the banks of the DudhKosi, crossing this majestic river many times on exciting suspension bridges laden with prayer flags. After entering Sagamartha National Park, the trail climbs steeply with breath-taking views. Namche Bazaar known as the Gateway to Everest which is home to many quality restaurants, hotels, lodges, shops, money exchange, internet cafe and a bakery. Namche is one of the biggest villages along the whole Everest trail. Day 06: Rest day or excursion to Khumjung and Kunde, overnight in lodge. We take the day off to allow our bodies to adjust to the rarefied atmosphere before ascending to higher altitudes. 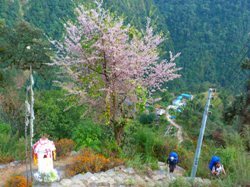 The secret of safe acclimatization is to "climb high, sleep low" so it is safe for the more energetic amongst us to hike up the hill behind Namche to the airstrip at Syangboche, or stroll across to the museum behind the police post. Others may prefer to "chill out" and visit one of the lodges for a freshly-baked cinnamon roll. Namche is a busy and bustling trading place and there is always plenty going on. Day 07: Trek to Thame (5hrs, 3820m) overnight in lodge. After breakfast we come out of Namche Bazar east past the monastery and begin with a short uphill trek. On the left we have the KongdeRi (6187m) and the river that flows down into a ravine. On the right is the rocky Khumbi Yul La (5765m) and behind us, clearly visible is KusumKanguru (6,373 m). After an hour mostly downhill into the forest, the trip continues: the steep rise of about 50 m in altitude to reach a ridge around it. The river bed becomes closer and wider. We reach the village of Phorte and then the small town of Samde along stretch halfway up a slight slope leading to the bridge over the BhoteKoshi (3650 m) and about a half hour climb brings us to Thame. Day 08: Trek to Marlung, (6/7hrs, 4210m), overnight in lodge. The trail becomes even quieter today as we leave even the more adventurous Everest trekkers behind and head north beside the BhoteKhosi which means ‘River from Tibet’. We pass through the village of Tangmote and follow a wide trail which ascends gradually above the river. After approximately 2½ hours we pass through the village of Tharngga and a further hour of gentle ascent brings us to Marlung (4210m). Day 09: Additional Acclimatisation Day in Marlung (4210m). Day 10: Trek to Gokyo via Reno La pass (7/8hrs, 4790m) overnight in lodge. Early after breakfast we start for the lakes at Gokyo. We follow a very scenic path and then descend slightly, following one of the rivers which flow down the west side of the Ngozumpa Glacier. We climb a steep rocky incline into the valley by the side of the glacier, crossing the path which heads across the glacier to Cho La pass 5367m, walking by the side of the lake, the scenery is breath-taking with the summits of Cho Oyu and Gyachung Kang reflected in its emerald green waters. Day 11: Rest and hiking to Gokyo ri and back to Gokyo, overnight in lodge. Today we explore the Gokyo, if the weather is good, we grasp the opportunity to climb Gokyo Ri, from where, we can have a best view of Everest, Nuptse, Loptse and many more, return back to Gokyo. Day 12: Trek to Thangna (4/5hrs, 4700m) overnight in lodge. If GokyoRi has not been done the day before we do this today. GokyoRi is the highlight of this trip. Early morning, we hike up the toGokyoRi (Gokyo Peak). Climb to GokyoRi is obviously strenuous as it is steep up and takes about 3 to 4 hours to reach the top, but even from the trial scenery of Gokyo village on the edge of third lake overlooked by Cholatse and the broad Nogzumpa Glacier are mind blowing. We feel like we are surrounded by panoramic mountains like KusumKanguru, Thamserku, Kangtega, Taboche, Cholatse, Makalu, Lhotse, Nuptse, Everest, Changtse, and Pumori. Sight of sunrays kissing the Everest that towers over all surrounding peaks is unlike from Kala Patthar (from Kala PattharNuptse seems taller). Our GokyoRi visit will be unforgettable life time memories. We trek down to Gokyo and after breakfast we trek to Thaknak for overnight being by the second Lakes and the Ngozumba Glacier. Day 13: Trek to Luboche, via Chola pass, 5367m (6/7hrs, 4950m) overnight in lodge. Cho La Pass has to be the second highlight of this trip. Today is going to be one of the tough days, the pass is not itself difficult but it is steep and involves a glacier traverse on the Eastern side. We need to be careful as the trail is vertical and the rocks glazed by ice add trouble to the trekkers making the trail slippery. Our trail climbs through a ravine and a rocky trail we climb up continuously up from Phedi. As we gain height, the view gets increasingly captivating before us. We trek through the side of a frozen lake while we come to the top of the pass decorated with prayer flags. We’ll see prominent mountains during the trail on the Pass and from the top are KyajoRi, Tengkangpoche, Numbur, Kangchung etc. The pyramidal AmaDablam presides over a range of mountains on the South even as Cholatse soar on the west and Lobuche East and Baruntse rises sharply to our right. We need to pass through some crevasses before we reach Dzongla, another beautiful place with a complete view of Mt. Cholatse, Mt. AmaDablam, Lobuche peak and the Pheriche village far below. Depending upon our condition and interest, we might take overnight at Dzongla or simply go ahead to Lobuche for overnight. However, the idea is better to go up to Lobuche same day to ease our next day's Everest Base Camp ascent and also that lodges are better in Lobuche than that of Dzongla. If we decide to continue, we climb down from Dzongla and after crossing a bridge and transverse through grassy trail. Enjoying the view of Lobuche Peak we stretch up eventually through a ridge. 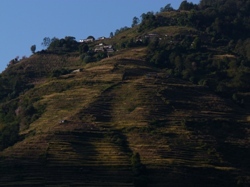 AmaDablam, Kangtega, ThamserkuTaboche are seen looming prominently. Curving round through the wide gravelly river bed, we reach Lobuche. Day 14: Trek to Groakshep and after lunch excursion to EBC (6/7 hrs, 5180m) overnight in lodge. we take the trail to Everest Base Camp through the once vast GorakShep lake. Continuing straight ahead, we come through the Indian army mountaineers' memorials. The path from here can be misleading, we follow the lead Sherpa, every year the trail changes due to the movements of the glacier, the walk is quite strenuous due to thin air in high altitude, the walk passes through over rocky dunes and moraine and streams, until we reach the base camp. As we reach Everest Base Camp we cannot stop our self from appreciating the Everest climbers those take the hazardous route through the Khumbu Icefall. Everest Base Camp is lively with commotion during the high expedition season. Mountaineer's tents stand out in bright colors against all the dull gray surroundings (especially in spring). Nuptse, Khumbuste, Pumori are the mountains we can view from base camp but Everest itself is not visible from here. We get back to GorakShep for a good night's rest. Day 15: Early morning to Kala Patthar and trek to Labuche (7/8 hrs/4380m) overnight in lodge. Early morning, when the sun begins to rise over the Everest, we make our way to the top of one of the finest viewpoints in the Khumbu, Kala Pattar (5554m) from where, we can have close and fantastic views of Everest including Nuptse and Loptse, then we turn back to Lodge, after breakfast, downhill to Luboche. Day 16: Trek to Chukung via Kingma la pass 5535m (7/8hrs, 4750m) overnight in lodge. After breakfast we trek to Chukung via Khumbu Glacier and Kongma base camp and continues ascending to Kongma pass the ascend is difficult part of our trek today. After gaining the Kongma La, we see cairn wrapped in prayer flags, marks of the pass. Then we descend gradually down the ImjaKhola valley to Chhukung, a small summer settlement. Day 17: Trek to Tengboche (4/5hrs, 3840m), overnight in lodge. Today’s trek is mostly downhill, we cross the Khumbu Khola on a wooden suspension bridge and follow the ImjaKhola to the village of Pangboche then continue to fallow the river and after crossing it, climb through birch and rhododendron forest to Tenboche, from there we can have a best view of Kuwangde, Everest, Amadablam, Thengboche is known as a famous monastery, where we can practice mediation. Day 18: Trek to Namche Bazaar (4/5hrs, 3440m), overnight in lodge. We will trek down through the hillside blanketed by rhododendron and juniper trees. If it's spring, pink and red rhododendron flowers ablaze our surroundings. After crossing the prayer flag festooned bridge over the DudhKoshi River trail then follows the DudhKoshi gorge descending rapidly through the pine forests. The path eventually reaches Sansa which is the major trail junction in the region. We stop at Kyangjuma (3570 m) for a relaxed lunch. Following lunch, the trail to Namche Bazaar clings to the steep wooded slope beyond Kyangjuma, winding through several bends. After passing a Chorten, we reach the army camp at of Namche Bazaar. We want to take a long last look back to Lhotse, the tip of Everest and Tengboche from here. On reaching our lodge, we take a nice hot shower and have very relaxed sleep in our room in Namche Bazaar. Day 19: Trek to Phagding (2600, 5hrs) overnight in lodge. The trail descends steeply downward so we need to walk slowly and under control as our shaky legs continuously battle the rocky terrain. After crossing the suspension bridges over the fast flowing Dudh Koshi and its tributaries the trail becomes more level and natural. By today we start to get warmed up by the light breeze. Any remaining sore throats and colds will be gone by today as we pass through this charming mountain air to Phagding. Day 20: Trek to Lukla ( 2850m,3/4hrs) overnight in lodge. After breakfast, we start trek same route down, we feel completely different views, we snap a mixture of open plains, rhododendron and pine forests, and in the distance snow covered peaks. We walk through the Sherpa villages' noticing impressive faith in Buddhism and culture of prayer stones and prayers flag while we walk through the villages. On arrival in Lukla, we stretch those sore legs and recall the experiences of the last couple of weeks. We experience the culmination of a fantastic trek on a happy note with everyone back safe and sound with smile on their faces. Day21: Flight to Kathmandu, transfer to hotel, Day at leisure. Day 22: free to explore around in Kathmandu valley, overnight in a hotel. Day 23: Transfer to international airport in Kathmandu, return flight to UK. Whilst on trek you will be staying in simple lodges or tents along the trail. These are an essential part of the trekking experience in the Himalayas, as you will be staying with other fellow trekkers from around the world, sharing stories and maybe a few games of cards in the evenings… In Kathmandu we shall be using a local 3 star hotel—this means it will be comfortable, well located, and with running hot water (most of the time) and en-suite facilities. Remember this is Nepal—and not England! What is a Level 4.5 Trekking Challenge Like? You are now moving into the realms of serious challenges - where you are likely to encounter carrying loads, rough terrain, sleep deprivation, or high altitude. In any case - be prepared for an event which is going to take you to the limits of your comfort zone. Trekking days will be up to 13 hours, or slightly less if the event stretches over several days. The severity of the challenge may be magnified by various factors - as you will need to be more resilient - due to simple living conditions - i.e. using same clothes for several days, lack of washing facilities, simple food, variable weather conditions and maybe camping - this forms a part of the challenge. You need to be in good shape to undertake any of these events, so you need to be training regularly. The height gain each day is greater than for level 3 - so expect plenty of hills! How Fit Do I need to be to join a Level 4.5 ‘Trek’? To participate in these events you need to be in good fitness. You enjoy taking exercise, and do it regularly (a couple of times a week minimum). You partake in several different types of activity, possibly including the gym, swimming, running, circuit training. You probably are capable of running up to 5 or 6 miles, but in a good steady speed (around 9-10 minute miles). If you do not run - you should be regularly undertaking challenging walks or other strenuous exercise. You should be comfortable walking 18-20 miles in the English lowland countryside. One of the most fascinating things about Nepal is that in the space of a hundred miles you can go from the coldest and most bitter conditions on earth to the sweltering heat of the North Indian Plain. In general it’s best to plan for temperate conditions ranging to around freezing on most trekking itineraries. Temperatures in the daytime range from +5—+20 degrees Celsius, with evenings being 8 to 10 degrees cooler. The best times of the year by far are the spring and the autumn. Whilst it is possible to trek during winter—it’s a little cold for most people. The monsoon is not fun—as paths are washed out, it’s exceptionally humid, and you’ll spend a lot of time wet through! Most people are surprised to find that Nepal is actually the same latitude as Florida or Egypt, the extremes in temperature and climate are all do to altitude variations.